Inter captain Mauro Icardi revelled in scoring a late winner to beat AC Milan for the second Serie A season in a row. Icardi's hat-trick settled the derby last term and he was the decisive factor again in a 1-0 win for Luciano Spalletti's side on Sunday. And after sending Inter up to third by earning their seventh straight win in all competitions, Icardi was thrilled to have downed Milan again, having earlier had a goal ruled out for offside. "Derbies have to be won, we've been saying it all week," Icardi said to Sky Sport Italia. "We had chances, hit the woodwork, had a goal disallowed, so we deserved to win it for what we created over the 90 minutes. "Winning it like this at the 92nd minute, that makes it even more enjoyable." 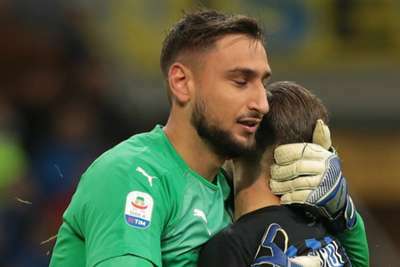 After Juventus dropped points for the first time this season by drawing against Genoa on Saturday, Inter move to within six points of the champions. And Icardi indicated Inter believe they can mount a Scudetto push having secured a return to the Champions League last season. "We must continue like this," Icardi added. "I said before going on international duty [with Argentina] that Inter have to win for all these wonderful fans at San Siro, and for us, because we must get used to winning consistently and making a habit out of victory. "It's up to us to find consistency, then we'll see at the end of the season where we are. We have to continue like this and keep picking up the wins. We know the potential in our squad and that we can fight it out with everyone."